Turkey. Wow. A new meal. And I thought I’d seen everything! So the turkey wasn’t bad; the mush around it wasn’t that fantastic. Carrots tasted fresh though. My favorite thing to eat at lunch is a turkey sandwich. I also like tuna. What do you like to eat at lunch? One positive in the project is that on the average I’m eating more veggies at lunch than I did before. I might have lettuce or spinach on a sandwich. Or a tomato and if I’m really lucky sliced avocado. What’s your favorite lunch veggie? what IS that stuff around the turkey? gravy? My favorite lunch veggie is the humble carrot stick. I also love sprouts on sandwiches! In elementary school a girl in my class used to bully me for my cream cheese & sprouts sandwiches (on whole wheat). She was a hot luncher, I was a brown-bagger…need I say more? Actually I should give that cafeteria some credit. Overcooked vegetables aside, they made almost everything from scratch, and the kids ate with real silverware on divided trays. Their most popular menu item was "turkey gravy over mashed potatoes with hot roll" and every component was made from scratch. They roasted the turkey, made the turkey & veggie gravy, and mashed real potatoes…and baked the rolls. I wonder what that cafeteria is serving now! Good questions. I usually have some kind of protein and a salad. So, favorite lunch veggie would be salad: a variety of veggies. I would so love to see you get a salad one day, even if it's one of those simple airline-type salads. Is that turkey and stuffing? Turkey and gravy? It's terribly unclear from the picture (not a good sign, I expect). @pennermag: I'm going to guess turkey slices with stuffing and gravy both, all cooked together. My favorite lunch veggies…avocado is probably the big winner, but that's not an everyday thing. Cucumber, sprouts, spinach, and bell pepper (especially red ones!) are top of the list as far as a salad or sandwich is concerned. I've never been a big fan of just munching raw veggies, though. I need 'em in a wrap, on wheat bread, in a salad, or *something*. I assume the 'mush' was gravy? I like salads or rice bowls with brown rice and veggies. A grilled veggie sandwich is also a favorite! Definitely an apple, every day. Plain Greek yogurt mixed with lots of crushed walnuts, honey, and sometimes different berries or grapes. Takes a little time to make in the mornings, but oh man is it satisfying come lunch time!! Or you can make a big batch and eat it throughout the week. The the nuts get less acidic and kind of satisfyingly soft and good. Same with the berries. Usually, I have a baguette with butter, ham/salami, and mozzarella cheese. I'm lucky enough to have a packed lunch every day at school. I really appreciate it. Sometimes, I have a different kind of meat or cheese, but thats generally what it is. My favorite lunch time veggie is probably carrots. Plain and simple! My favorite lunchtime veggies is either celery or carrots. Our turkey and gravy lunches were always diced turkey in gravy over mashed potatoes, and it was actually a favorite of mine. I know that it wasn't "real" turkey like at Thanksgiving, probably some sort of processed turkey loaf, but it was still really good. In fact, it was usually what they served for the "Happy Birthday" lunch each month(except November), along with birthday cake, always a treat. Unfortunately, they don't have the birthday lunches anymore; they're not allowed to serve the cake. Because a 2-inch square of cake is so much worse for you than chili cheese nachos, right? Nothing to do with turkey or Mrs. Q's lunch today, but…my son's school had fresh strawberries on the menu today. I was volunteering there today and saw the berries. They were MASSIVE, like the size of a small apple. It was crazy. It just made me wonder what they were sprayed with to make them get so big, you know? I LOVE chicken salad sandwiches for lunch, don't know why, but I do. I like to eat olives, too. I guess that's a veggie. I loke to eat riceballs. In Japan,there are so many kinds of riceball even in convenience store!! when you'll have chance to come to Japan,please check it out!! When you ask what people like to eat at lunch…do you mean what actually eat the most for lunch or what we would WISH to eat? That's turkey in there?? I like to take your lunch photo and try to guess the entree without looking at the title. I identified yesterday's chili only by the tortilla chips and cheese goo on the side. Today's, um, turkey was not identifiable! At lunch, I really enjoy a good bowl of soup or stew. It's always been a favorite of mine. Cheese and crackers and some fruit. And lots of ice water! OH MY! That is hands down the worst looking lunch they've served you yet…and turkey use to be my hot lunch favorite (although it was with stuffing, REAL mashed potatoes, and home made rolls). You've been elevate to a whole new level of awesomeness in my book for braving that meal in the name of this project. As for your questions: I'm a SAHM so I enjoy leftovers from dinner or an egg salad sandwich. My favorite lunch veggie is english cucumbers or red peppers with hummus. My favorite lunch to eat is a peanut butter and jam sandwich made with real natural "stir first" peanut butter and homemade blackberry jam made my yours truely. As for lunch veggie, broccoli and bonus points if dipped in some light ranch dressing. MMM…. Your favorite lunches sound great! I can live vicariously when I eat school lunch. Thanks for sharing! I'm a vegan, so my lunch is usually all veggies. 🙂 I love veggie sandwiches with baked chips, salsa and a piece of fruit. Yum! I'm a college student, and one of my favorite things to eat when I'm in a hurry is these bagel sandwiches sold on campus. They have shredded carrots, cucumber, lettuce and dill flavored cream cheese. I always pack carrot sticks and hummus in my lunch. However, as a vegetarian, it's easy for me to incorporate veggies in other aspects of my lunches. for example, today's lunch included leftover pasta with sugar snap peas. I've also been known to make sandwiches piled with alfalfa sprouts, tomato slices, lettuce, cucumbers, pepperoncini peppers (sometimes), and either hummus or laughing cow cheese. I love salad for lunch, but not just lettuce. I do marinated beets, sesame green beans or asparagus with sliced toasted almonds, tuna and avocado. Yum! I would have to say my favorite lunch veggie is whatever veggie I had for dinner the night before…today it was the asparagus in the risotto I made, tomorrow it will be the yellow tomatoes and strawberries with balsamic vinegar. Sometimes I forgo the veggie entirely and stick with fresh fruit and greek yogurt. Ugh, that's some nasty-looking turkey and goo. My favorite lunch is minestrone soup and crackers, a peanut butter and honey sandwich on wheat bread, or a baked potato with cheese. 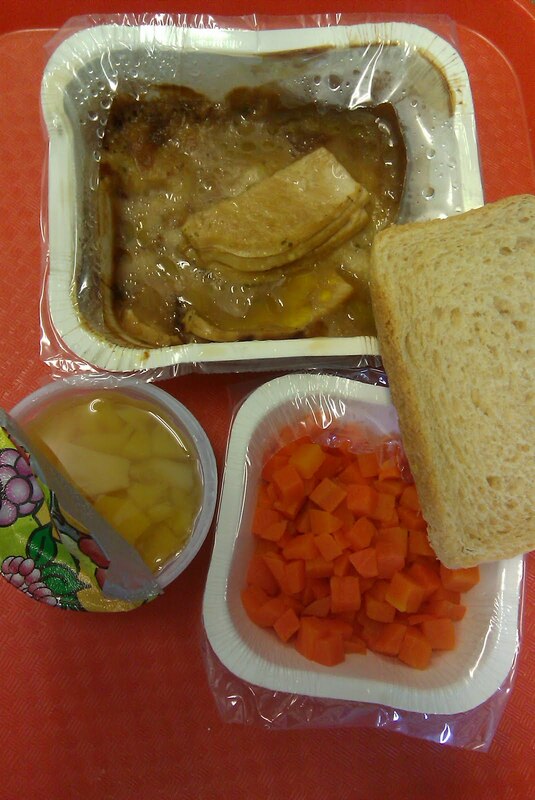 Favorite lunch veggie is carrot sticks. That's turkey? It looks more like a piece of pancake dipped in a lot of maple syrup to me O_O. that turkey just looks NASTY! my favorite lunch veggie is baby carrots. actually thats my favorite anytime veggie…i looooove baby carrots! I like a good chicken Caesar salad or a turkey sandwich (really turkey, not whatever they are trying to pass off for turkey in that pic). As for my favorite veg, I'm a big fan of the carrot stick, maybe with a little ranch dressing. My favorite lunch is a veggie sandwich (goat cheese, tomato and lettuce) on a whole wheat bread heated on a skillet for a few minutes on each side to toast it. I would have to say Avocado! My favorite lunch veggie is a cucumber, sliced with skin on. I usually have leftovers for lunch, but I love sushi (Spicy tuna or salmon). Today I had lunch with my son at school. It was his first school lunch! (He's 6) It was cheese pizza (a real slice in a box), raw broccoli, carrots and cauliflower (good, but with about 1/2 cup of ranch), wheat roll (something I love about school bread), iced tea (made for parents and teachers, he had chocolate milk) and peaches in a cup (frozen with added sugar and asorbic acid "for color"). All in all a decent lunch, could have done without the additives in th epeaches and with less ranch. I wish I had taken a picture. We are lucky, all of our school food is made at a giant kitchen in the district. Nxt week I am going to eat with my 9 year old. I think I will go on Southwest Chicken Salad day. BTW, I am glad you enjoyed your lunch. The "turkey" looks awful. My favourite veg would be lettuce.. I work at an elementary school and the only time I buy a school lunch is if they are having chili. My favorite lunch to take is a turkey/cheese sandwich, veggies and a fresh fruit. That is usually an apple, strawberries or an orange. My favorite veggies to take are sliced cucumber, bell pepper and carrots. I should keep track of how many bags of mini carrots I purchase during the school year. My all-time favorite lunch is a BLT, featuring a perfectly ripe tomato so fresh it's still warm from the sun in my backyard, with spinach (or other greens) from my garden, with home-made mayo and bread. YUM! Of course, that perfect confluence of ingredients rarely happens…. My 2 favorite veggies are avacado and home-grown tomatoes. That's processed TV dinner turkey. My current favorite lunch, that I eat four days a week, is a grilled chicken wrap with ranch dressing and a fruit and yogurt parfait….from McDonald's! Our fave lunch veggie would have to be raw carrots. Everyone likes them, they hold up well in a lunch box, and they taste good plain or dipped in dressing, dip, PB, etc. Looking at that just makes me never want to offer a tv dinner to my child as a "quick meal". . . not that I have yet – she's 2…she's pretty easy so far. But to think they might get packaged food like that at lunch and dinner? Seems too much food covered by plastic! I like to eat a very light lunch when I'm at work, to avoid that mid-afternoon slump. Anything heavy or hot is bad so I stick to fridge friendly foods and NEVER choose pasta. I also never choose anything too fragrant like tuna – that's for my colleagues' benefit. If I'm absolutely starving, I'll cook up one of my emergency "back-up" Lean Cuisine meals – but I only eat the Veggie Egg Roll & Rice, Chicken Enchilada or Sesame Chicken varieties. VERY rarely!!! Today, I am actually having my favorite veggie (do I have to pick just one?!?!) A steamed artichoke for lunch. Also, I have some crackers and string cheese. mmmm mmm good! I LOVE chicken salad sandwiches! They're the best! I also usually like cranberry or grapefruit juice in little bottles. Delicious! My favorite 'lunch' veggie is red pepper.